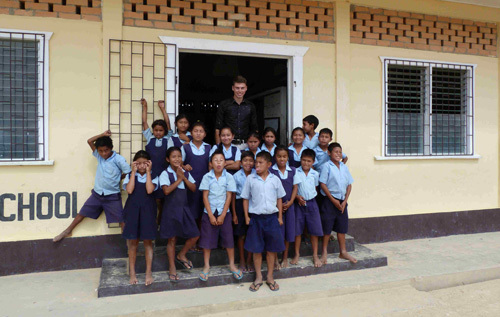 The Mason Trust has helped an enterprising Reepham College student fulfil his dream of spending a year volunteering by providing a grant to assist him with travel costs to Guyana. Dex Scarlett became captivated with the possibility of spending a year living and working overseas after a returning volunteer with Project Trust came to talk to the students of the College. The selection process for Project Trust was rigorous: Dex spent several days at its home on the Hebridean Isle of Coll with other applicants, undertaking a series of tasks to determine their strengths. This was followed by discussion about the different projects available to them, and having passed this stage, they were given training in basic teaching techniques and useful educational activities. He was finally allocated a teaching project in the interior of Guyana, where he is currently working in Kato in one of the South American country’s remotest primary schools. Dex is teaching Grade 5 pupils aged 9/10 years for a year in a very different environment to the one he was used to: a two-roomed school, with each room further divided by blackboards to accommodate the various grades. The children were each given a pencil, rubber and their books; textbooks had to be shared, sometimes between four. “In a way, the lack of facilities forced me to be more creative, and could make lessons more interesting for both me and the pupils,” Dex commented. The charitable organisation was set up in 2008 by Mrs Mason, a successful businesswoman with more than 25 years’ experience in the marine industry.